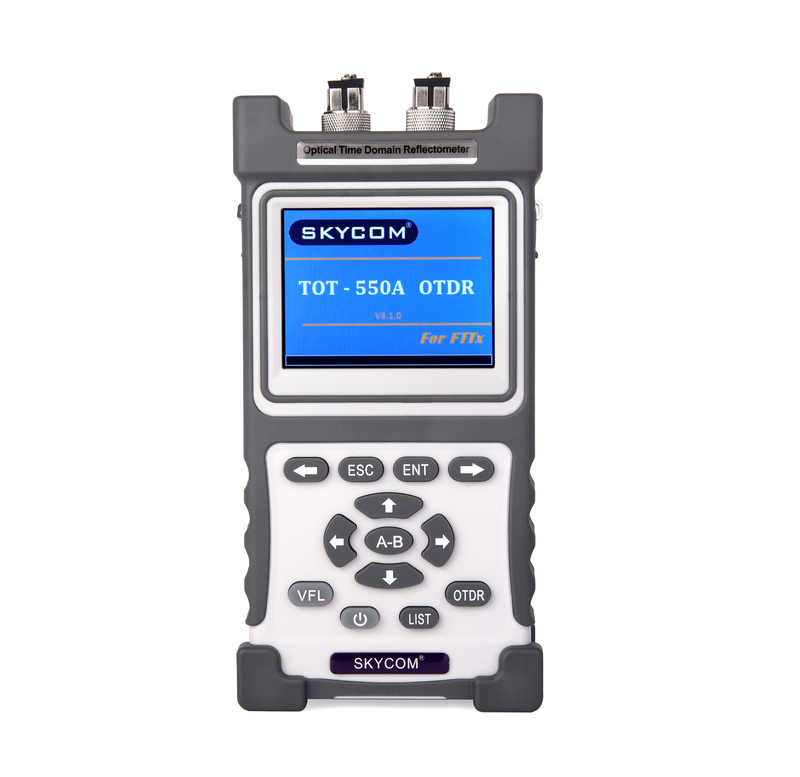 - Buy Product on NanJing-SKYCOM Communication Ltd.
TOT550 series OTDR is a newly hand-held and intelligent communication measuring device in accordance with the test of Optical fiber and Communication System. TOT550 series OTDR is a newly hand-held and intelligent communication measuring device in accordance with the test of Optical fiber and Communication System. The product is used to measure the parameters like optical fibers, length of the optical fiber, loss, following quality and the like. It can quickly and accurately position the case point and fault point of the optical fiber link. It can be widely used in the engineering construction, route maintenance and urgent repair of the Optical fiber and Communication System. It can also be used in optical fiber and optical cable development as well as production measurement. The product can effectively do help to the installation and construction of the optical fiber network, the following speedy and effective maintenance and the troubleshooting test. TOT550 series OTDR is sturdy and durable with a novel and attractive appearance. The most succinct operation interface with a simple and intuitive style is specially designed for the domestic users. The dual operation mode of press key and touch screen effectively simplifies the application of the users. You can obtain the test result by the one-click analysis and the events will appear on the main interface in a list form with the information of event number, type, location (distance), loss, reflex, gradient of the events (attenuation) and total loss. Intelligent power management mode is employed to the machine. The working duration of the machine can be more than 10 hours with the high-capacity lithium battery. Ø The novel and beautiful structural design of the appearance. Ø The most convenient operation mode in the industry is as simple as available. Ø ultra-short event dead zone can test the wire jumper of the optical fiber. Ø It can test the circuit with light and give an alarm, avoiding existence of the equipment whose signal light is damaged in the optical fiber tested. Ø High-power visible laser fault location function is equipped inside. Ø USB interface can transfer the documents and make the report forms fast. Ø Universal light output interface which is easy to be replaced enables a variety of interface tests. Ø The working duration of more than 8 hours enables long-time field construction. Ø Multiple choices of wavelengths and dynamic ranges best meet the requirement of the users. Ø Highly intelligent analytical software can accurately recognize the melting point of the fault. The junctor may bend. TOT550 series OTDR is equipped with the most succinct operation interface, which is specially designed for the users. With a simple and intuitive style, there are only 6 operation menus on the optimized interface. The operation is so simple that it is easy to acquire it without professional training. The unique dual operation mode of press key and touch screen among the similar products in the industry effectively simplifies the application of the users. TOT550 series OTDR is equipped with shortcut key of trace analysis, which can quickly and accurately find the event point or fault point and its position information of the trace tested. Then it will list all the information in the circuits, which do great help to the maintainers, improving the testing efficiency as well as ignoring the cumbersome background. The tiny test dead zone and large dynamic range of TOT550 series OTDR can meet both the testing of optical fiber wire jumper and the long-distance testing field. It is of highest cost performance! When OTDR is testing optical fiber link, the result will be inaccurate if there is communication optical signal in the optical fiber. Communication optical signal may even damage the optical receiver of the machine. 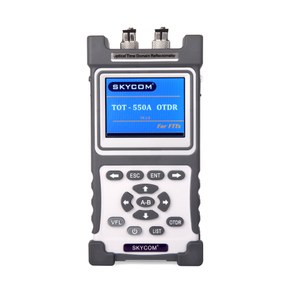 TOT550 series OTDR can automatically monitor the communication optical signal in the optical fiber. Once the optical signal is detected, the connector will give an alarm, which provides the machine with a fastest and timeliest protection. TOT550 series OTDR built-in high-power visible red light fault location function can find the short distance optical fiber link breakpoint or the position of a big loss point conveniently and directly. Combined with OTDR function, it can enable a seamless monitoring of the chain and test, so that the maintainer can take measures in time and save time. The universal light interface equipped to TOT550 series OTDR is easy to be replaced and cleaned. It can enable tests for many kinds of interfaces such as FC, SC and ST. The simulation software can analyze, edit and derive the data stored by instruments, and it can generate the complete and professional OTDR report in a convenient and fast way. Note: The standard configuration of OTDR interface type is FC/UPC. The type of FC/APC is optional. If necessary, please contact us.